"I made this for a baby shower and was bombarded with requests for the recipe! It is delicious on its own, or with small bread slices or crackers. Don't skimp by not using the homemade mayonnaise, it really adds a special flavor! Makes a 2-quart serving dish full, so if there will be other foods, this will serve at least six, maybe even up to ten!" Bring a large pot of water to a boil. Add the chicken and simmer until cooked through, approximately 10 minutes. Drain, cool and cut into cubes. While boiling chicken, make the mayonnaise: Using a blender or hand-held electric mixer, beat the egg, mustard, salt, water and vinegar until light and frothy. Add the oil a tablespoon at a time, beating thoroughly after each addition. Once mixture begins to thicken, you can add oil more quickly. Continue until mixture reaches the consistency of creamy mayonnaise. NOTE: The more oil you add, the thicker it gets; you may not need the full cup of oil. 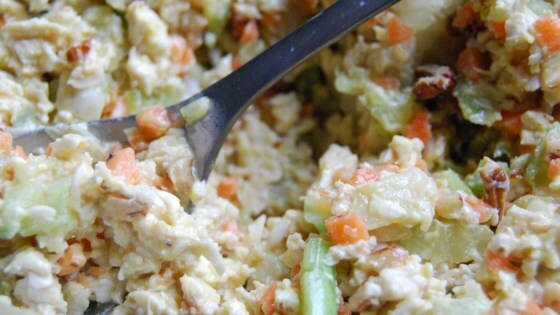 In a large bowl, toss together the chicken, grapes, pecans, blue cheese and 1 cup of the mayonnaise. Stir until evenly coated, adding more mayonnaise if necessary. Refrigerate until serving. I made this recipe following it exactly. The mayonnaise just tasted awful so I used regular mayonnaise (with a little sugar) and it all turned out great. Really delicious. I have made this several times and have always receivedh huge compliments. The homemade mayo is a great touch that makes this recipe much better than others!! Very easy recipe and tasty too, except I would not make the homemade mayo due to raw eggs and salmonella so I used a name brand mayo which worked just as well. I gave it four stars!